Medical Center of Plano is a full-service, 427-bed acute-care facility with more than 1,300 employees and over 900 physicians on staff, representing over 70 specialties and subspecialties. 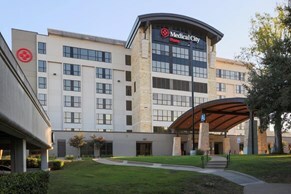 Our main campus in the heart of Plano includes the main hospital and medical offices, an outpatient surgery center, an emergency trauma center, a radiology/imaging center, a comprehensive cardiovascular program, and complete women's and children's services including a high-risk ante-partum unit and an NICU. Accredited by the Joint Commission on Accreditation of Healthcare Organizations (JCAHO), Medical Center of Plano continued its legacy of firsts in 2007 by becoming the first hospital in Collin County to achieve elite Magnet Recognition from the American Nurse's Association and was also named a Nurse-Friendly Hospital by the Texas Nurses Association. NeuroLink Brain & Spine Services, the region's most comprehensive resource for neurological care, includes BrainSUITE, a state-of-the-art neurosurgical operating room (OR) that fully integrates all relevant surgical and diagnostic tools, including intra-operative, high-field magnetic resonance imaging (iMRI) to treat complicated neurosurgical cases. Women sLink Women s Services includes an on-campus Diagnostic Center, featuring digital mammography. HEARTLINK Cardiovascular Services celebrated 20 years of world-class diagnosis and treatment in 2007. There's a real difference at Medical Center of Plano, and it's evident in the way we touch the lives of those we treat.